We provide innovative solutions, worldwide proven, that will enable fast and effective results. Let us know what you are working on now and we will help you on the journey to achieve operational excellence. Do you want to run your plant based on accurate real time data? Our solutions allow you to easily capture valuable data from your manufacturing process, contextualizing them into real-time information for decision-making across the company. Would you like to quickly start run a smart manufacturing? Do not wait any longer! Watch the performance of your operations in real time, using mobile devices, having event notifications on your smartphone and with advanced analytics through BI solutions. Do not have CAPEX? No problem. You can rent our solution. Do you need to visualize and improve the performance of your operations? From a small plant to multisite operations, we are experts about managing business KPI’s. Reduce now operational costs, gaining flexibility and better demand fulfillment. Would you like to be warned before the situation gets out of hand? It does not matter where you and your team are. We will notify the resources in real time, based on responsibility, so that actions can be taken immediately. Make technology work for you! Need to improve quality procedures? Empower your procedures by controlling workflows and electronically managing SOPs, tasks, statistical process control data, critical point control – HACCP, and more. Achieve world-class quality! Do you want to avoid downtime caused by human failures? Have full governance of the versions and backups of the applications of your automation devices and avoid downtime in your production. Be prepared for disasters or cyber-attacks. Do you want more control over maintenance activities? Reduce maintenance costs by using quantitative and qualitative fault information, increasing visibility of planned and unplanned activities, and through the effective management of maintenance KPIs. Would you like to manage movements and stocks in real time? Manage material consumption, have complete traceability, lot, operator and asset, optimize inventory levels, and be prepared with the flexibility you need to manufacture the future. Would you like to effectively manage weighing and batching? 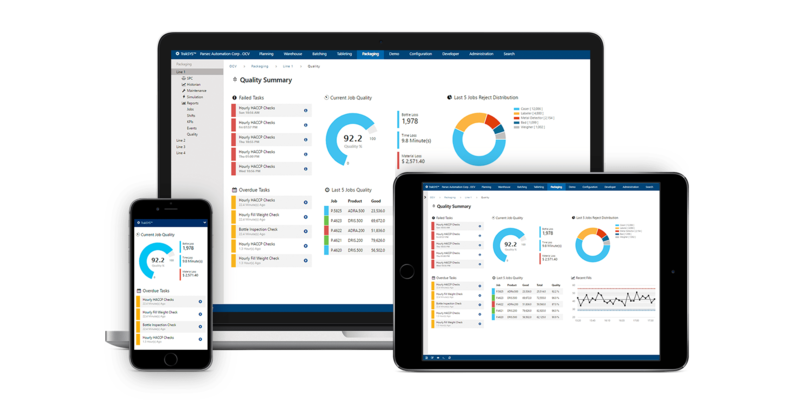 With complete electronic audit trail, manage SOPs, tasks, recipes, versions, materials, assets and labor, meeting all the requirements for your weighing process and EBR. The TrakSYS™ tools provided by HSI, allowed acceleration never seen before on performance analysis and problems investigation culminating in improving main manufacturing indicators, positioning Suzano plant in the internal podium of Agfa manufacturing plants of offset plates around the world. In a country so devoid of productivity examples, exceptionally Agfa Brazil with its plant in Suzano, consolidates with customers in Latin America as a major partner in the continental printing market. TrakSYS™ is a powerful tool for quickly uncovering the root causes of production problems. It has empowered our LEAN program by systematically eliminating production bottlenecks. In fact, for some of ur critical systems, we envision doubling our measured productivity. This has enabled us to reduce overtime and meeting the production demand in fewer shifts. TrakSYS™ is today more than a tool for monitoring equipment performance. This has already done in our productive environments for almost 10 years (Formulation, Weighing, Packaging and Productive Maintenance). With the support and flexibility of HSI, we have also been able to develop custom reports and Andons, which allow us to evaluate the status of the production process in real time. The factory team uses this information daily in their routine and time optimization / decision making, has been of great benefit.